Planning to have fun, meet the local culture and the best places to see? Black Cat Hostel is the right choice for you! Near to the hostel you can find the most important touristic places like the Government Palace, the Congress Building, the Cabildo, the first train station in South America, the Independence House and plenty more. You also have a lot of restaurants, banks, boutiques, bars and pubs in the area. We have shared dorms and private rooms available with comfortable beds (with or without a/c). There's a TV room where you can see some of our DVD's or just watch cable TV, a beautiful courtyard to relax, a fully equipped kitchen, free internet access and free WiFi. Our hostel is at the centre of the historical downtown, there's no need to take a bus to see the most important spots. And if you feel like party, we have the best advice for that. Asuncion has a crazy nightlife and we're sure you will enjoy every moment here, but we have to warn you... you may never want to leave! 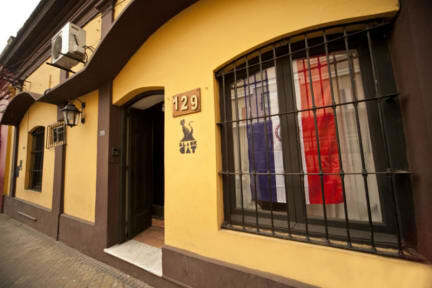 This is a wonderful hostel located in the central part of Asuncion close to all important buildings and sites. The staff is very kind and everything is clean and tidy. The establishment has all types of rooms including different sizes of doorms and private rooms. In addition its historically the first of its kind in Paraguay. Strongly recommended. My only complaint was the beg bugs. But I informed them and they will do the necessary. There were spare beds I could move to so it was no issue. Location is fantastic. Great hostel, probably there's no way another hostel can be better located than this one, you're free to drink alcohol and smoke inside the hostel (in the proper areas for doing that, of course). It's cheap, so don't expect luxury - really, the breakfast, for example, was waaaaaay too simple. Violeta and Fernando (two members of the staff) are the best, awesome people! Great location, right in the heart of Asuncion. Friendly staff. I really enjoyed my stay and the easy access to the facilities. Cleanliness was alright, but not great, especially in the bathrooms. Very good value for money. Old school, booked a double but got a bunk and a single. Rooms very open so no privacy or mosquito control. Wiring sketchy. Great location good security and very helpful staff, dorms looked ok not sure it's worth the extra for the double. So... everyone should know that the hostel is called Black Cat because it all stinks of cats. They walk into rooms (like any other cat would, of course) like they own the place. Apart from that, the staff is incredibly friendly and helpful. No other hostel can beat its location either.